In the wake of every tragedy to touch the U.S., social media fills with Christians calling for "thoughts and prayers." Elected officials quickly get in on the act, and this includes both Democrats and Republicans. These calls are inevitably followed by a chorus of mild outrage and mockery by atheists and others who recognize that calls for prayer accomplish little. Some take aim primarily at the elected officials, pointing out how inappropriate it is to use their offices to promote religiosity (i.e., prayer). Others aim more broadly, reminding their audience that "thoughts and prayers" serve primarily to make one feel that one is helping without actually having to help. We have seen this happen again and again, as tragedies are never in short supply. I feel a similar sense of unease; however, mine has a somewhat different cause. My unease is due to what seems like an endless parade of political opportunists misusing their offices to promote prayer. For example, I find it highly inappropriate that Sen. Chuck Grassley or any other elected official would use his or her office to promote religious beliefs or practices of any kind. And yes, calling for prayer strikes me as a promotion of religious practices. As for the question of whether "thoughts and prayers" accomplish anything, I'll acknowledge that they can if they motivate meaningful action. If thinking (or even praying) about tragedies motivates someone to do something meaningful, then I'm all for it. But for the most part, expressing the "thoughts and prayers" mantra on social media seems to be little more than virtue signaling (i.e., the expression of a sentiment unaccompanied by the intent to do anything). I suspect this is part of why such calls elicit the reactions they do. Obradovich clearly believes in some sort of god. She's wrong, of course. There isn't anything on the receiving end of her prayers. But that really isn't the point here. The point is that nobody is telling her not to pray to her preferred god. What we are telling her is that spouting off about it on social media isn't accomplishing much of anything and that we are losing patience with it. Similarly, we aren't telling Sen. Grassley not to pray; we are telling him not to continue using his office to promote prayer. 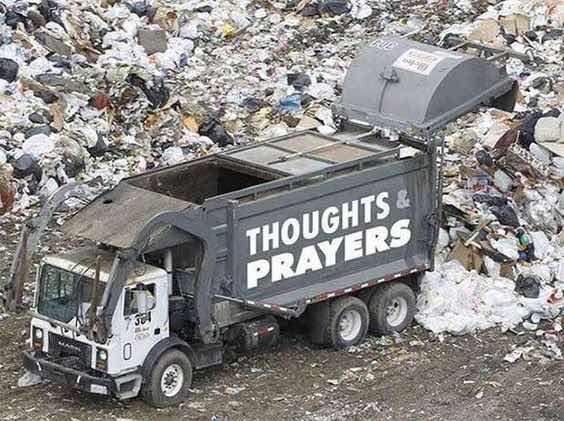 Here's the thing about "thoughts and prayers" that always seems to be missed: unless you broadcast you are doing it on social media, nobody knows or cares. Think and pray all you want. If it helps lead you to action, that's fantastic. What we are talking about isn't that you are thinking or praying; it is the shallow "thoughts and prayers" sentiments you are expressing on social media. See the difference? I do think that Obradovich makes some valid points about how we cannot expect to win allies while mocking their profession of religion. She's probably right about that. At the same time, I think it is a mistake to dilute our message for fear that the other side will use it to attack us. They are already doing that and far worse. Atheists have been silent for far too long as it is. Holding our tongues for fear the other side might demonize us might make sense if the other side had ever stopped demonizing us, but that is not the case.